Drawing on a shoal of slabs was a winning ticket for Paul Chapman in Newport’s Abbey Pits league final leg. Netting 11 fish for an impressive 54-7 gave him a runaway win – and put him well clear at the top of the overall table with 12 points. Dave Tebbutt made second on the day with 19-13 and second league spot on 15 points. Steve Glidewell was third on the day 4-11. Following the discovery of another illegal net set on a city water, local anglers are being urged – wherever they fish – to look out for signs of fish theft or attempted theft and, if they see anything, to report it immediately. 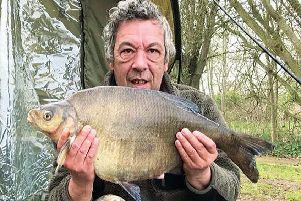 The latest find came on Furzton at the weekend – within days of a net, with five dead double-figure carp in it, being recovered from Lodge – and it was promptly destroyed to prevent re-use. Anyone seeing fish thieves in action should call the police on 999 or, if it is too late to catch the crims in the act, on 101 (15 pence irrespective of call length or whether or not you are using a mobile). Stealing fish is a crime so please quote the code 116/11 to the police to ensure that it is logged, and reacted to, as a crime. Please also notify the Environment Agency on 0800 80 70 60 and the club running the water. If you find evidence of attempted theft (staked out nets, set lines or whatever) again please call 101 and quote 116/11. MKAA head coach Nuala Gray was part of Suffolk County’s bronze-winning team in Saturday’s rain-lashed Ladies National on a Leicestershire carp lake – contributing 4 kilo to her side’s 28 kilo. Gilders Tackle, Northampton, staffer Dan Todd bagged bream to 6lb during a ‘taster’ session on Tear Drops. Willards’ Dave Duwell had perch to 2lb on maggott from Bradwell canal, Sunday. Tove Valley Matchgroup’s Lakeside do saw Chris Garrett win with 115-06 ahead of Phil Bardell 104-11 and Dave Martin 88-9. Carp were up in the water for Osprey’s visit to Rolfe’s where Neil Riddy netted 105lb, Kieran Chavder 98lb and Keith Stent 97lb. Towcester Vets, Tofts: Ron Collins 63-6, Gerald Greene 49lb, Mick Read 29-8. Towcester/Nene, Bairstows: Les Ramsden 20-8, John Balhatchett 14-6, Brian Beard 10-8. MK Vets, Linford Fishery: Ernie Sattler 19-5, Bob Gale 18-15, Barry Witteridge 14-8. Calvert v Buckingham, Claydon Lake: Dave Lewis 13-13, Austin Maddock 5-11, Mick Reynolds 5-1. DATS Tuesday evening league, Navvi canal: Ernie Sattler 12-13 of bream from an end peg, Lee Jones 5-11, Richard Lattimer 5-4. Linford, canal: Tom Hefferon 5-6, Ron Dorrill 5-4, Pete Whatley 3lb.